Childhood, food and a long lost table cloth. It’s funny in my mind at least how different times were in the 1970’s than they are now. From a childs point of view we were much like the Victorians in the 19thC than what we are like in the modern day. We had to be polite to everyone and if not quite “seen but not heard”, certainly not to be seen in anything like an equal in status to the grown-ups as most modern-day children seem to be. There was no back-chat to adults and if you did anything wrong you would get smacked and not necessarily just by your parents. Our entertainment was simple, books, board games and if we were really lucky a game that required batteries. There were no computers, radios had a handful of channels and the TV had just 3 channels and they didn’t start until hours after breakfast. If there were 15 minutes of childrens shows on a Sunday and we managed to see them, then we were lucky. It was a time when the old fashioned ways of giving the television a rest for a while and there was only one television. This was from a relatively tech advanced family too. We got our first VCR around about 1979 and were so excited that my brother and I watched the same 15 minute cartoon dozens of times. How cool to watch what you want when you want… that would never catch on would it. We also got our first computer on Christmas Eve 1980, a Commodore Vic20. We used to play outside a lot then. In the summer I could be out from 7.30am until 9 or 10pm just riding my bike up and down the same street or two. We’d play lots of football (soccer), not normally hitting anyones parked car. There was lots of running around playing hide and seek or Whip 123. I used to love that, finding new and impossible to get places just within 100 feet of my home. We’d all stretch the boundaries and more than once my neighbour allowed me to hide in his car. The 1980’s when even Kids shows were adult and people fought probably without kewl Matrix style fights. There was lots of sword fighting and bows and arrows. 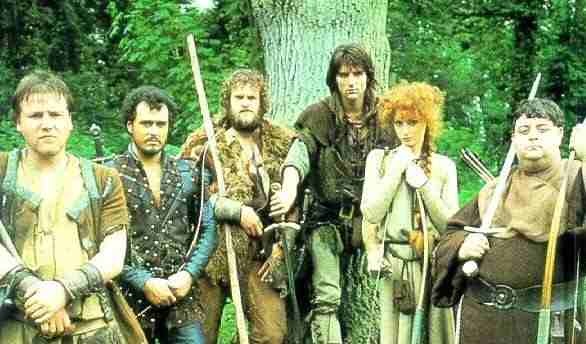 Robin of Sherwood was a very popular TV show in the 1980’s and we all loved making our own quite fine wooden weapons. This is the definitive Robin Hood and even though it is now 30 years old, it is still more gritty and realistic than the current BBC Robin Hood where both his merry men and the evil soldiers in Nottingham look like they would get beaten up by any 1970’s teenager let alone know how to climb any trees. I can’t believe that I still haven’t been to Nottingham or the famous tree in Sherwood Forest. Hmmm. Combined with army games and British Bulldog which anyone who has played it will remember as quite bruising. Injuries and cuts and bruises were commonplace and all the boys in our street would frequently get bashed about a bit and whereas now, these games wouldn’t be allowed or the children even allowed outside with injuries turned into big dramas and trips to hospitals for us it was just kind of fun. Nobody wanted to stay in and watch TV or go on the internet. Our games were active and full of imagination. Whether they were bikes, roller skates, skateboards, home-made go-karts, fun, excitement, a near miss that was usually ignored and a final big crash was never more than a few hours a way. Everything was different back then. I had a “long” 1.25 mile walk home from school up a steep 500 foot hill. I did that walk almost every day for 5 years with one or two heavy school bags to carry too. It was too hot in the summer, too snowy and freezing cold 2 or 3 months in the winter and frequently soaking wet in between. We lived furthest from the school and I should have realised then that my long walk home was a portents of long commutes to come. After that walk home and often of course the walk there too I was ready for something to eat. We had vaguely set meals for each day of the week with more salads in the summer and hardly any in the winter. 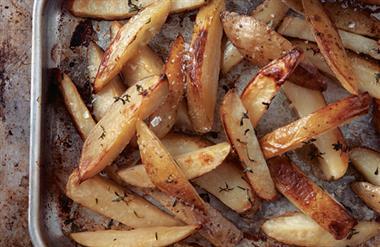 On Mondays it would often be boiled buttery potato with beans and sausages or sometimes a jacket potato. 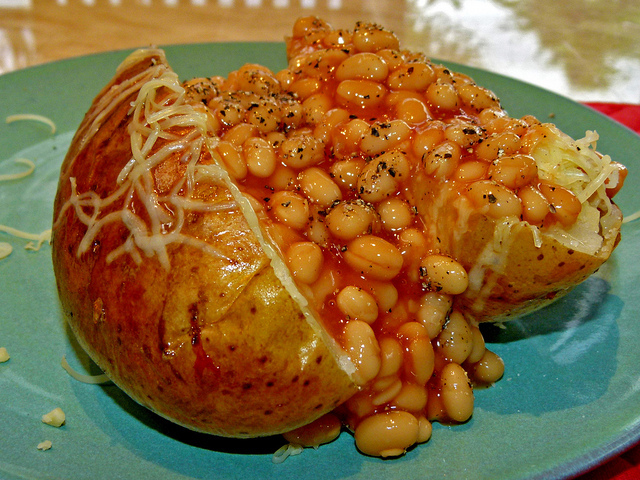 Jacket Potato with baked beans and grated cheese. Tuesday would sometimes be Shepherds Pie. 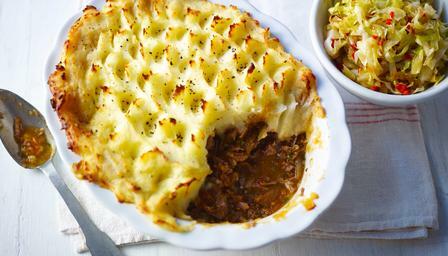 Shepherds Pie is actually eaten across much of Europe, the Middle-East and South America. Shepherds Pie has lamb in it, Cottage Pie has beef in it and Fish Pie has pork in it, no it doesn’t I’m being silly. 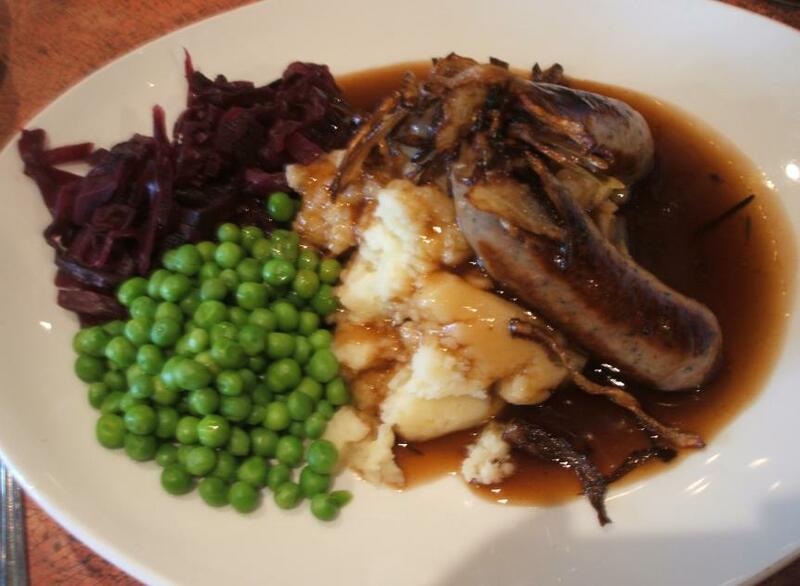 Wednesday often Chicken or bangers and mash. The perfect food after walking home from school in the snow. 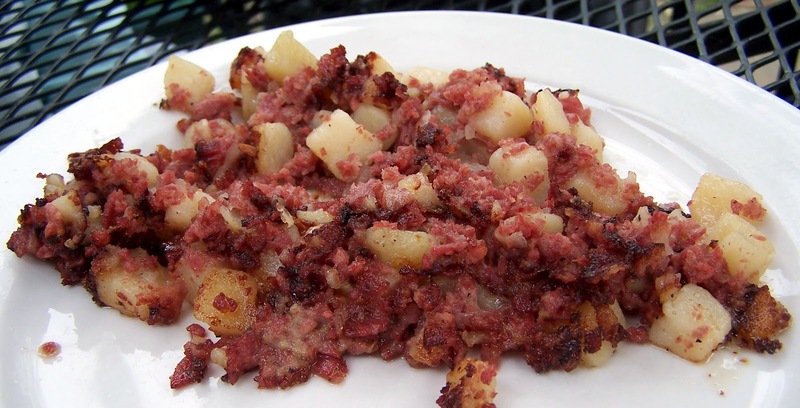 Thursday would so often be Corned Beef Hash. That always tasted delicious. I used to love the hard and slightly burned bits of corned beef or potato, that was where the flavour was. Always warm and filling, sometimes if I ate it too quickly I could feel it burning my tummy. It wasn’t a bad feeling either, at least as far as burning is concerned. Totally delicious Corned Beef Hash. Friday was the end of the school week, yay! Two days of freedom. In Britain it used to be tradition to have fish and chips, I of course hate fish so I would have sausage and chips. Here’s the chips but it looks like someone has already eaten the sausage! 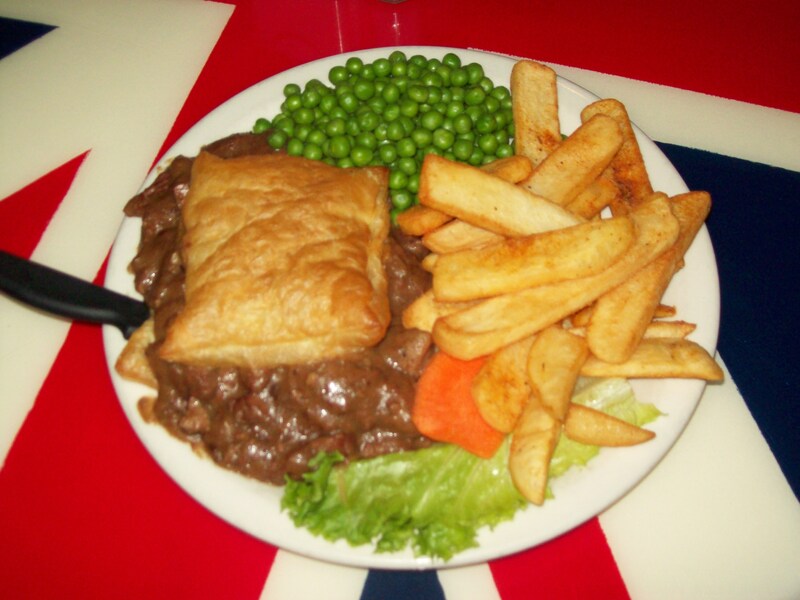 Saturday was, if we were good steak and kidney pie though by my teenage years, this was often moved to fridays and the chips were moved to Saturday. Those readers in America will see our chips are somewhat chunky and not at all like McDonald style fries. To me, they taste so much nicer, are more filling and considered healthier too. Sunday was always a roast dinner. The meat would either be beef or lamb, sometimes pork or Chicken. When I was a teen, they were by far the nicest meal of the week but for the first 10 or 12 years they were sometimes a real trial. Much of the food that I like, isn’t what my parents commonly ate and much of what they commonly ate, wasn’t to my liking. I was often thought to be a fussy eater but the truth is, these days I will eat almost anything. It is just that the few things they often ate were and remain the few things I don’t like. I hated sprouts and still do and yet we had to eat them most Sundays. The same for cauliflower too. I liked carrots but no-one else did, at least not like I did and do. I love peas too but my mother hated them, she would always leave them on her plate even as restaurants. I also love parsnips, sweet potato, leeks and other things we never ate and the funny thing is, we never ate parsnips when i was growing up. When decades later, my parents came to my house, neither of them barely touched them and no-one I know likes salads like I do. I was never fussy, I just had different tastes! Typical Sunday Roast Dinner as Wikipedia shows it though in truth ours always looked much nicer than that. When on a Sunday there were sprouts or cauliflower on my plate it was always bad news. I was told that there were starving people in Ethiopia who would love it and yet we never sent them any of mine and I was always happy to do so. Besides which they probably wouldn’t eat English food any more than I would eat theirs. I would be told that in my parents time you had what you were given and ate it whether you liked it or not (well isn’t that what was happening to me now in 1979?). I lost count of how many times I would sit at my seat from 1pm until 3pm, sometimes until 5pm as I summed up all my courage to eat these yucky sprouts or kidney meat. I hated every one of them and later loved how when George Bush Senior became the U.S. President he refused to eat Broccoli. He said that when he was young he was forced to eat it all the time and he hated it and now he was president and could eat whatever the hell he wanted. I bet if he reads this blog, he will sympathise with me and would have roast parsnips and chicken any day of the week other sprouts and things. In our first home, the house was heated by convection heaters where hot air would blow up through vents in the floor. These vents were awesome for shoving sprouts down them when no-one was looking. You just had to make sure the sprouts were not too fat to push them through the vents and make sure there was no gravy left as evidence. When I was 8 years old we moved 330 miles south to a place just above London. There were no air-vents, what would I do? I was quickly saved as a few months later we had ourselves a little Beagle puppy named Ben. In many ways Ben was often my best friend and I would play with him for hours and when older go off for long hikes through the woods with him. He also had a vociferous appetite. He would eat anything whether it was meant for him or not. He even drank alcohol would love mints which he would first roll on before he ate them, even though it made him sneeze. Ben was a God-send in many ways but as a bonus he would often sneak into the dining room and I would slowly feed him the unwanted elements of my Sunday dinner once other people had left the room. I didn’t mind if it took 20 minutes to do it without getting caught, it was better than being stuck at the table for 4 hours when my friends were playing outside. Of course there were always that once or twice a year when my plan if not failed then got severely derailed. I would drop food down onto the carpet and he would sniff at it and then leave it alone. What was he doing, he was a hound? He ate anything, were some of these sprouts or cauliflower cheese so bad that even my dog who loved smelly socks would refuse to touch them? Just great, now what was I supposed to do with some cold mushy, gravy covered sprouts that had been on the carpet and covered with fluff and dogginess? It was a moment of despair, I can tell you. Normally though I would drop the bits of food on dark coloured bits of the carpet and the chances are that Ben would soon sniff around a few hours later and eat them up before they were discovered. Is there a morale to this story? Probably not except I preferred getting hit by bows and arrows and cutting my leg falling off bikes and out of trees than eating sprouts. However there is a point to this story, I bet you didn’t expect that did you? My mother had a huge collection of table-cloths and being at the table for so long, I became overly familiar with all of them. My favourite was the Australia table-cloth. It had a huge map of Australia on it. On the nice food days, I would get enjoyment from looking at the sites and on the bad Sundays I would become a complete expert on Australia. There is a little island above mainland Australia called Groote Island, that is where it was found out that I was on my way after my mother had climbed down a rope ladder and paddled ashore in a hollowed out wood canoe to an Aboriginal reserve. As such I always felt a connection to that island and to that lovely table-cloth especially as they had brought it all the way back to England by ship. Two months before my Mama died, I asked her about it, she had used it for 30 years or more but I hadn’t seen it recently and if she didn’t want it then I would have it for old times sakes. After a week or two off looking, my mother told me that it had gone mouldy after being stored in a damp cupboard under the sink and it had gone off to table-cloth heaven. That was that or so I thought but then a few weeks later I thought I might check out Ebay. They have all sorts of things on there and it is true there were many Australian table-cloths but not my one. I thought perhaps I would be pushing my luck. How many people in England are going to have a near 40 year old table cloth of a specific design that was apparently only sold in Australia? After a little searching I found one but due to the events of March and April, despite it coming up for sale twice I had missed it and later it had been bought. The seller hugely sympathised with me. I might never find one again but then if one person is selling it the chances are someone else will. A month or so ago I checked again and there were two Australia tablecloths of the design I wanted. One of which was authentic and original but still in wrapping and they wanted just £2 or $3.40 for it. I bid and so did one or two others but believe me, no-one was going to outbid me for it and at about £6 everyone else gave up. Two weeks later it arrived, my mother would have loved it and I felt instant nostalgia for it. It may have well been the exact same table cloth. I instantly knew all the features of the map, the tropical turtles by the Great Barrier Reef, the surfer dudes and babes, cowboys, Sydney Harbour Bridge, the gold mines, kangaroos and Ayrs Rock and up near the top there was Groote Island, exactly where I left it 39 years ago… or 15 years ago if we are talking table clothes. My long awaited and still brand new looking table-cloth, it’s so big I can’t even take the photo properly! On Sunday 6th October there is a small memorial service at Church which remembers everyone who has had their funeral there in the last 2 years. 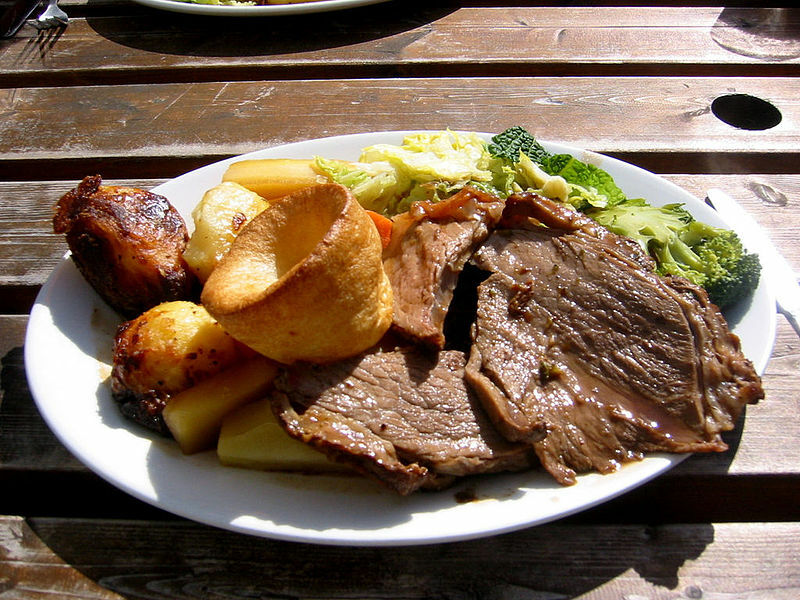 Before we go there, we will have a Sunday Roast dinner on top of the Australia table cloth. It will be rather like old times. My Mama will be there in spirit and Ben too, I’ll still be looking at the feature of this table-cloth but this time I definitely won’t be eating any sprouts though if it would bring my Mama back then I would eat a whole plateful in 60 seconds flat. This entry was posted in Life and tagged childhood, food, Life, Mama, nostalgia, outdoors. Bookmark the permalink. 3 Responses to Childhood, food and a long lost table cloth. Wonderful memories, Stephen. I so enjoyed reading this. Thanks Rosemarie. I enjoyed writing this one too. what a lovely glimpse of childhood… Nice tablecloth!